Startup Humai has a mission - they want to make sure you never die. And they're willing to implement a variety of science-fictional technologies to make sure you stick around. Where does the biology and computer science meet? The short answer is: Bionics, nanotechnology and artificial intelligence. I think the body has limitations and I don't believe the body was evolved with the best possible functions. I think an artificial body will contribute more to the human experience. It will extend the human experience. So much so, that those who accept death will probably change their mind. I'm pretty sure I've read this story before. In his 1936 novelet Revenge of the Robot, Otis Adelbert Kline described a man who was murdered - but came back to confront his murderer! "You are undoubtedly a robot," admitted the President. "Now, will you be good enough to show us your reasoning mechanism?" "First," said the robot, "I will tell you what Bradshaw discovered after more than twenty years of research. There can be no reasoning or thought without life. All life as we know it is a combination of two things—mind and matter. We have never been able to discover any form of life that is not a combination of both. The brain is not the mind, but in human beings it is the medium through which it makes itself manifest. Behold! He snatched off the blond wig and skull-case. The astounded onlookers saw a human brain snugly encased in a transparent skull-shaped receptacle. Tenuous, fine strands, almost inviible, extended in an intricate network over the delicate brain membranes. The hairlike strands almost completely covered the cerebellum and cerebrum, converging in the sickle- shaped partition of the falx cebri, which divides the two hemispheres of the cerebrum. The entire brain was immersed in some viscous solution, it envelop the' exposed furrows and convolutions. 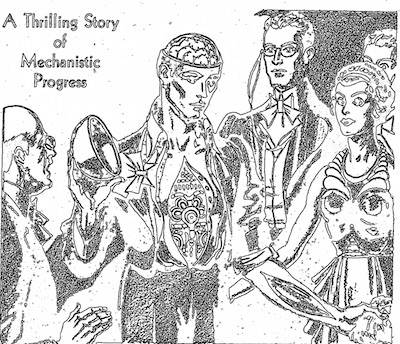 I was thinking of titling this article "A Thrilling Story of Mechanistic Progress", but it was taken - eighty years ago. Via @Humai and PopSci, via TechSpot.